Given my prior post on goals for 2017, it seems only fair to revisit my goals from 2016, part of 1001 Arabian Mites. In the post I listed five areas to focus on in 2016. Now that we are firmly in 2017 I thought a brief report card is in order. 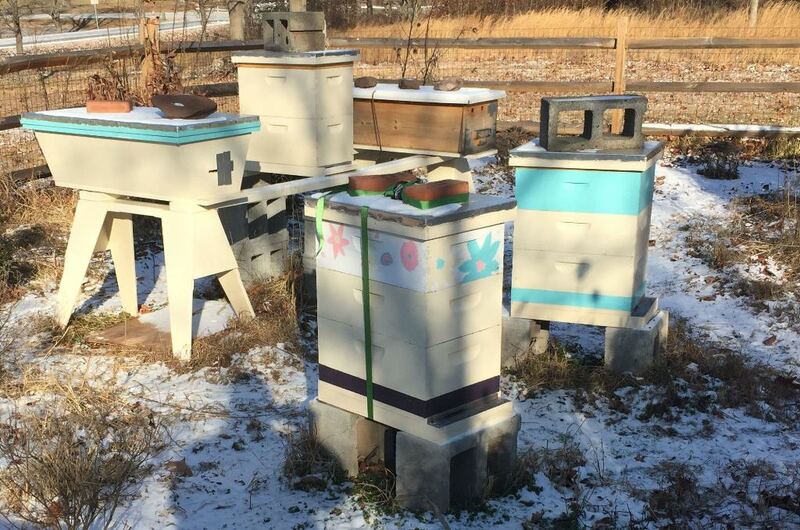 Last year, according to my post, I set out to gather some honey, deploy a new top bar hive, perform a split, expand the fish pond, and move to all medium boxes. So how did we do? For fun I graded these on a standard U.S. grading scale, from A (best), B, C, D, or F (fail). I did collect some honey last year (I’ve got my mind on my honey), albeit only a handful of jars. I had queen problems and swarm problems, for which I was partly to blame. So I give myself a middle grade. I hope to do better in 2017. This was done quite successfully, although it did take me two tries. I put some bees and a queen cell in the hive in early spring, and it got really cold and they died. In April my hive Jupiter swarmed (Bees of a feather swarm together), and the new top bar hive became Saturn which has done great. So not perfect, but successful. I ended up doing multiple spits last year. The first was done hurriedly to prevent swarming, when I was sick and had to travel for work that same day (A hive divided against itself cannot stand). This hive became Ganymede, which did so well I split it again later in the season (into a nuc which I gave to a friend). So I would say this goal was met and then some. Ah, the pond. The poor fish are going through their second winter in a tub, with a horse trough heater keeping them warm and me swapping some water every week or so to keep them oxygenated. My planned work to expand their home never quite happened. Well, it’s a good thing these grades are totally made up. A mixed message here. On the one hand I did move both Mars and Jupiter to use only medium boxes. They are both overwintering with three mediums. Mars seems quite well so far, Jupiter is still alive though with a small cluster. The latest mite drops on their screened bottom boards have been 1-2 mites per day the past couple weeks, which is good. So success on this front. My two deep boxes I consolidated into the hive that became Ganymede. I was thinking I would sell this hive last year, but the extra effort involved never happened so I did not. In Virginia you are required to have your apiary inspected to sell bees. If I have the time and ambition this year, I will create a nuc or two and retire or sell Ganymede as two separate deep hives. I am definitely keeping any new hives in medium boxes. I like the ease of lifting both boxes and frames compared with the deep boxes. I also bought a medium nuc last year, which I did not use. I finally painted it this winter and hope to try it out in 2017. The grades are made up and the points don’t matter. Still, on a four-point scale (A is 4, F is 0), I would have 12 points for five goals. So my 2016 grade point average (GPA) is 2.4, which is a C (maybe a C+). That failing F in Expanding Fish Pond really pulled down my average. I am unsure all five hives will make it to spring, given I went into winter with fewer stores than I would have hoped. So a middling C for the year is probably a fair grade. This year I’ll do better, Mom, I promise! I found this quote in my Facts of File Proverbs book, although it was mute on the origin. After much searching, I finally found an online reference in google books from The Dictionary of Modern Proverbs by Charles Clay Doyle. According to this reference, the quote appears in the late 1920’s and appeared to be well-known even then. Clearly I need this book, so I ordered it yesterday on Amazon. The quote captures the somewhat cynical notion that politicians don’t stick to their principles once in office. By my thinking, this can have an upside. While politicians certainly lack scruples at times, the art of compromise also involves relaxing principles to achieve a shared goal. In the U.S. at least, the willingness to compromise has seemed rather missing of late. With beekeeping, lots of us approach the hobby wide-eyed and excited, and it is easy to have strict principles before we have bees. Opinions about types of hives, treatments, and even bees abound. Eventually we find our own way, and some principles are adjusted or relaxed accordingly. Perhaps I am starting to do this for 2017. We shall see. Considering that the fish have not died yet you may consider giving yourself an ‘I’ for ‘incomplete’. That allows you to finish in the first part of the next semester or quarter or year. Or, since this is a bee blog, you may regard fish-pond-expansion as one of those classes like gym that do not get included in a grade point. And you should get an A+ for the splits class, although we do not know how that affects the numbers. Ha! I thought about C+ and B-, where the +/- would add or subtract 0.5 to the score. Given this is all made up, it seemed easier to keep it simple. Good point on the Expanding Fish Pond score, though. Definitely not part of my major, and if I remove this from the overall score 12 out of 4 is a solid B (3.0). I also can’t do math apparently, since 12 out of 5 is 2.4 (I originally had 2.2). I corrected this in the post, so perhaps a C+ overall for the year. These grades are hilarious, but you’ve graded yourself too harshly! You got some honey in your second year, which is great. So many people lose all their bees in Year 1 and have to start over in Year 2, so kudos! You caught a swarm, made splits, your fish are alive, your bees are healthy — all awesome things! BTW, I don’t know about your school district, but ours doesn’t use grades A-D/F anymore. Instead, we have E (Exceeds Expectation), M (Meets Expectation), A (Approaching Expectation), B (Below Expectation). There is one other letter either before or after B, but I’ve forgotten it. For me personally, beekeeping is sometimes Below Expectation, but 85% of the time (I can make up numbers, too) it’s a habitual process of either Approaching or Meeting Expectation. If I experience an E, it’s usually a happy mistake or coincidence. Well, there are so many answers! You may be right, although perhaps we water down the value of an A so much that it loses meaning. An A should be exceptional work, or so some would argue. Or perhaps I am too harsh and the grades should serve to validate and build confidence in my abilities as a beekeeper. Higher grades serve to inspire and encourage me to do even better this year. Just because Expanding Fish Pond was an elective doesn’t mean that it shouldn’t count. Electives are important too, and I did sign up for the course. It’s amazing how many cliches of education we could apply. Too much fun. We do in fact still use the A-D/F scale around here. I’m not sure what I’d do with an E, M, A, B scale as it would totally throw me off. We have too many high-strung parents in Northern Virginia to move away from the traditional grading scale. You are correct about happy coincidences. My swarm last year was an accident, and a thoroughly enjoyable one. The bees find ways to teach us in spite of ourselves. Grading oneself is always a tricky endeavor. Better to be more strict with myself and receive such good comments. Thanks for your thoughts.